In July, Facebook rolled out a new “seen by” feature for groups, which let people know who has seen a post or announcement in that group, and when. And, although Facebook didn’t make much of a song and dance about it at the time, it looks like it is actually offering this feature on photos, too. As you can see in the screenshot below, the “seen by” feature in photos works just like the “seen by” feature for other group posts: someone who posts a photo to a group can see how many people in that group have viewed it, who those people are, and what time it was that they viewed the photo. And that information is not exclusive just to the poster, either — others in the group can see who viewed a particular picture, too. The “seen by” feature on a photo was first brought to our attention by Christo Wilson, a computer science PhD student at U.C. Santa Barbara, whose professor, Ben Zhao, was the one who first noticed it appear on a photo of his daughter that he posted to a group of users. Zhao told TechCrunch in an email that he first noticed it on Friday. “I have a lot of friends who visit a group page we created for my baby daughter, and the first timestamp showed up last night,” he said. 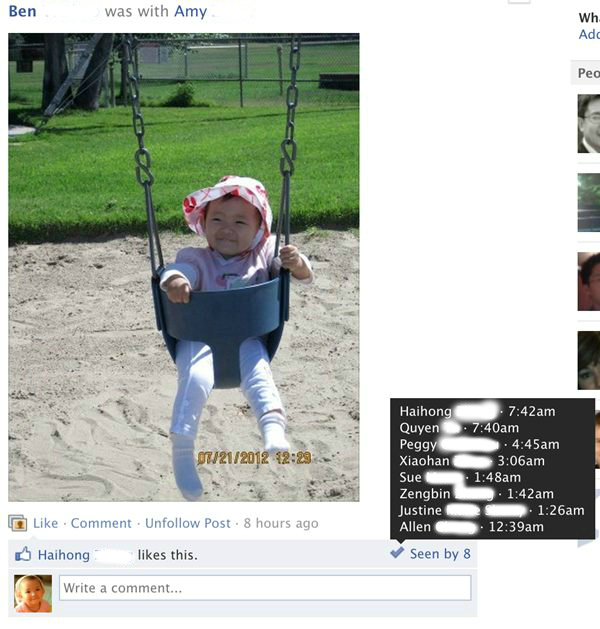 I joined Zhao’s daughter’s page as well, and I could also see the names of all the users who had viewed each photo. This feature doesn’t seem to be appearing on other Facebook groups that I am in, yet. It’s unclear whether Facebook would ever extend the “seen by” feature to photos that appear on all users’ accounts, not just those of groups. On the one hand, Facebook has clearly been growing the number of places where people can view who has viewed their content. In May, Facebook added “seen by” details to messages between individual users and groups. Then in July, it appeared on group posts. In that context, it makes sense for it to extend to group photos, and possibly more. But in any case, if privacy concerns and apprehension deters users from looking at photos, that would run counter to Facebook’s bigger strategy to get people using photos more, part of how it hopes to keep people engaged on its platform. If a feature like this, which basically will tell someone when you have looked at his/her photographs, feels uncomfortable now, there may well be a time when it feels less so. Facebook could be the one to usher in that change. In groups, that discomfort in any case should be less so — the picture has been sent to a group you are in, so of course you might look at it. That’s slightly different from visiting another user’s (say an ex-boyfriend’s) set of photos and browsing through them all. And it puts Facebook more in line with Path, which also lets users know who has viewed their “moments.” That alone could be a sign of how Facebook is trying to better tailor its service for those who want to use it in these more personal, traceable ways. We’re reaching out to Facebook about this feature and will update as we learn more. Update: Facebook confirmed both that photos posted to groups have been included in the feature since launch, and that the “seen by” feature is only for photos that are part of a group post, not others. “We have not announced plans to extend the seen by feature to other products beyond Messenger and Groups,” the spokesperson said.